I have always wanted to go to Japan ever since I picked up my first piece of Ikura. The culture, food and people caught my eye when I was very young and I planned on traveling to Japan when I turned 18. So this April, I am finally embarking on my journey to Tokyo and several other places in search of Ikura! 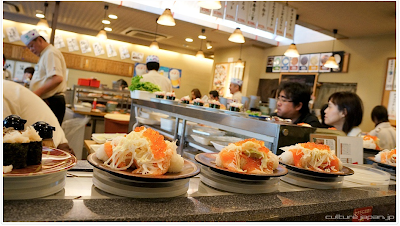 Upon my research, I found a fascinating website, which talks all about the traditions and rules of Japanese sushi conveyor belt restaurants (Sushi-Ya restaurants). The customs inside a Sushi-Ya are very unique from those in a typical American sushi restaurants, such as positioning your hands on the counter and ordering directly from the chef. This article depicts about one hundred photos of different types of sushi being ferried along a tabletop conveyor belt. The anticipation is ridiculous. I am so eager to immerse myself in Japanese culture, customs and most importantly, Ikura! Ikura 2 days in a row!! Yet again, another night filled with Ikura! There is no better way to spend a Friday night than to eat three pieces of Ikura from a local sushi restaurant called Fatty Fish in Glen Cove, NY. This Ikura was on the sweeter side, but just as delicious as any other Ikura that I have tasted! There's nothing like a great piece of Ikura for dinner. Tonight I went to Kotobuki in Roslyn, NY, and the Ikura there has a very distinct taste. It tastes a bit like soy sauce as well as sake; a very interesting and delicious marinade. Here's a link to a step by step procedure on how to prepare Ikura. From the moment it comes out of the Sujiko (egg sac) to when it's ready to serve, this website shows you ways to clean and marinate Ikura! I highly recommend checking this out and trying it yourself. Oh look Ikura...wait a minute!! I saw these bright orange spheres in a Red Mango yogurt shop and thought that it was Ikura! Sadly it is just strawberry tapioca balls. While doing the daily crossword, my sister read this clue (pictured above). Of course she knew the answer. After all, her brother is the world's premier and unrivaled Ikura blogger!! There's nothing like an Ikura dinner with your friends on a Saturday night at a local sushi restaurant called Fatty Fish in Glen Cove, NY! It seems as if Ikura is increasing in popularity, even in areas that are nowhere to close to where salmon are found. I am glad to see that people all around the United States are able to enjoy Ikura like me! Next time I visit my sister, I will be sure to stop into Whole Foods and try some of Minnesota's Ikura! An interesting use of Ikura, that I never thought of before! Bacon and Ikura seems like a perfect combo and I can't wait to make and taste it myself! Look what I found in Israel!! Here's another online source for Ikura. 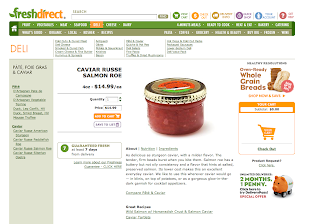 With just a click of your mouse, you could have fresh delectable Ikura at your doorstep, thanks to FreshDirect! Another find by my sister!! My sister brought my attention to the opening scene of Finding Nemo, which shows hundreds of pieces of Ikura! If you click the video and go to 1:16 you'll see these bright orange spheres! Ikurajon at the Yehuda Market in Jerusalem, Israel!! 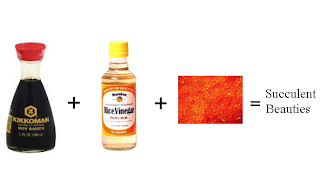 A step by step instruction on how to make Ikura!! Thank you to my father's friend Koichi, who is from Japan and who sent me this link on how to prepare Ikura. This is a complete, step by step set of instructions on how to take the Ikura out of the sojiko inside of the female salmon and how to prepare it. I especially enjoy the photographs that accompany the Japanese instructions. Check it out! This looks just like Ikura!! This orange sand inside this container mimics the appearance of Ikura! I found these in a local pharmacy, go figure! I have to go here when I go to Japan!! This is the Higo-Ikura railway station on the Kagoshima Main Line, which is operated by JR Kyushu in Tamana, Kumamoto, Japan on the south western coast. I wonder of they serve Ikura on the train? Now that would be truly amazing! I have been constantly in search of online distributors of Ikura and luckily I discovered a new website!! www.red-caviar.com offers fresh Alaskan Sockeye Salmon to be delivered right to your doorstep. 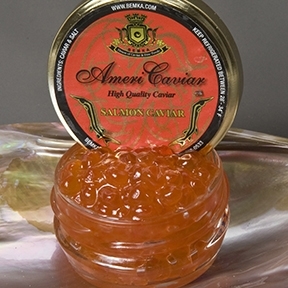 They feel that you should "treat your family or friends like royalty by giving them some of the world's finest and most rare caviar from Alaskan Salmon." I couldn't have said it better myself! A nice find by my cousin!! My cousin spotted this in Tensuke Market located in Elk Grove, Illinois!! Who knew that Ikura can be found in the Midwest?! Loving food must be something in my family's genes. My sister happened to send me a link to this, which is probably what I consider the most delectable roll that I have ever seen and not just because it is topped with Ikura!! Dinner with my best friends!! Tonight, my two best friends and I went to Rok N Sake sushi in Port Washington, NY for some Ikura. Both of my best friends have developed a love for Ikura as well, they even ordered four pieces!! It is so fascinating to watch what salmon have to endure in order to produce Ikura! These jars of caviar may appear to be Ikura, but sadly they're not. They are jars of carp roe. I found these in Tavlin Market located in Bellmore, NY. Another place to buy Ikura!! 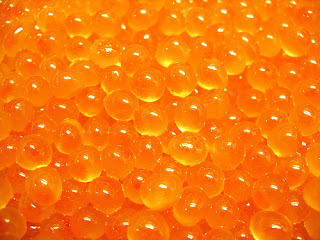 I have been searching the web for more places to purchase Ikura and I found this great website, www.caviarlover.com They have endless amounts of caviar, but more importantly they sell Ikura!! 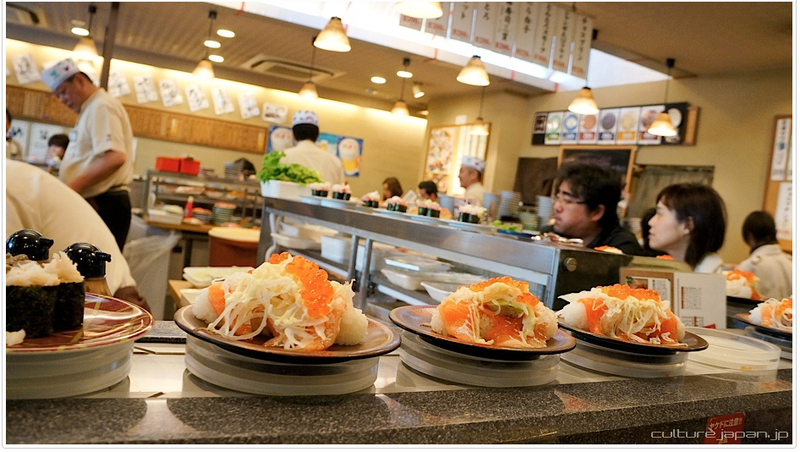 Sushi Mizutani, located in Chuo, Tokyo, Japan, is known as the the best sushi restaurant in all of Japan. It earned three Michelin Stars in 2009 and has been putting customers in awe ever since. However, if you wish to dine on this delectable food you have to make a reservation two months in advance and hope that you get one of the ten countertop seats in the whole restaurant. Chef Mizutani is nearing 70 years old, but his preparation of his seafood is known around the world. From endless amounts of Ikura, to fresh pink tuna, everything in this tiny space is of the highest quality. He is known to have the most delicate knife skills, making the fish the center of attention and not hindering its flavor or appeal. I am planning on traveling to Tokyo during the summer of 2012 and hopefully I will be lucky enough to sit in one of those ten wooden counter seats! A store for everything Japanese!! After school, my friend and I decided to venture over to H-Mart in Williston Park, NY. This is far more elaborate and cultural than your average super market. It has everything from seaweed to mochi to Ikura!! However, this Ikura is $7.99 for 4 ounces, a bit expensive, but it is the only supermarket around where I can find fresh Ikura! If you can't find Ikura in your town, check this out! I recently found this company online, which carries a large variety of seafood including Ikura from Alaska! You can order six ounces or one kilogram of sushi grade Alaskan Ikura for a reasonable price. I am about to order some myself, just so I can have it as an elaborate and tasty after school snack! A quick snack at Fatty Fish!! There's nothing like a snack right after school at a local sushi restaurant. Today I chose to head over to Fatty Fish in Glen Cove, NY to satisfy my daily Ikura craving!! Today I was incredibly hungry after school. So naturally I decided to head over to Toku in Manhasset, New York for a spicy tuna roll and a piece of Ikura! I guess my tongue has gotten used to the different marinades because the sushi chef was amazed when I knew that this Ikura had been marinated in sake. 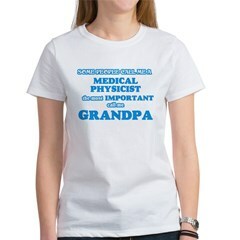 This is by far the coolest t-shirt I have ever seen. Just endless amounts of shirts that have giant clusters of Ikura right in the center. How great! Finally, someone decided to make shirts based on salmon roe, my dreams have come true. Lunch at the Chelsea Market!! The best place to find fresh fish in Manhattan is The Lobster Place inside the Chelsea Market. Fresh oysters, clams, fish and sushi are what make this place so popular. However, I recently discovered that there was a mini refrigerator atop one of the counters that only has caviar. Where you find caviar, you find Ikura. This Ikura happens to come from a distributor in Long Island City, New York. The only ingredients inside this glass jar is salmon roe and salt. Dinner at Blue Ribbon Sushi!! Check out the top of their website!! One of my favorite sushi restaurants in Manhattan is Blue Ribbon Sushi. It is a very discrete restaurant, with no sign or name on the outside. Walk down a few steps, open the large wooden door and you are inside. They have the freshest fish around, but that's not why I went there. I was there for two delicious pieces of Ikura. The unique thing about these pieces of Ikura, is the marinade they are soaked in. Head sushi chef Toshi Ueki-San marinates the sujiko (the sac of Ikura) in soy sauce, sake, and sugar. The sugar adds a bit of a sweet taste to it and also eradicates the fishy smell. Taking my first bite, these pieces of Ikura were so sweet as well as salty from the soy sauce. Their texture was similar to other pieces of Ikura I have had, but they were very flavorsome. My Birthday Dinner at Nobu!! I have always wanted to go to Nobu in New York City, and on my birthday that desire became reality! I entered through the two heavy wooden doors, covered with Zagat stickers and news articles, and immediately fell in love. I could smell the unique sauces and the fresh fish, all waiting to be plated and served to foodies like me. I enjoyed an amazing meal consisting of rock shrimp, striped bass, bluefin tuna, salmon and of course, a delectable piece of bright orange Ikura. This Ikura was like no other piece of Ikura I have tasted before. It was so fresh and had a perfect texture which was all due to the absence of a marinade. Head chef Tomi Naga-San chooses not to marinate the Ikura but rather keep it as is. It tasted fishy and salty which is why this Ikura is so unique. As I bit into it, each individual piece popped, releasing it's delicious liquid. Even though no marinade was used, this Ikura still had a great distinct taste. My Ikura journey brings me to Sag Harbor, a town just west of Montauk. Tonight, I ate at Sen, a well known Japanese restaurant, situated right on the main street. What I enjoyed the most about this Ikura, is that they label where it comes from. Finally, a restaurant that carries and uses Ikura from this country! Featured by Elegant Affairs in Hamptons Magazine, Ikura serves as a representation of something lavish and appealing. It's vivid color stops every reader as they gaze into the center of each piece of bright orange Ikura. Same shape and texture, but not Ikura. This pairing of small black and red tobiko (flying fish roe) may resemble minute pieces of Ikura, but sadly it is not. 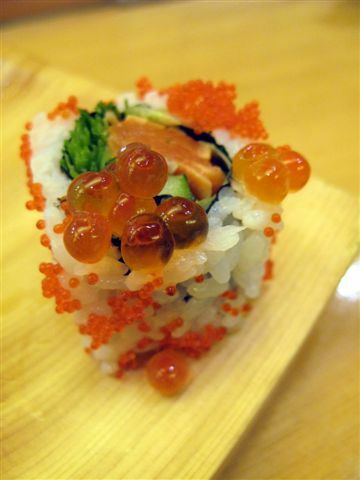 Tobiko are smaller than a piece of Ikura, but are larger than Masago (capelin roe). Tobiko come in a variety of colors with sizes ranging from 0.5mm to 0.8mm. Even children of celebrities enjoy Ikura!! As mentioned in People magazine, Chris Meloni's daughter, age 10, enjoys Ikura! Just like me, she craves succulent Ikura at a young age! Oh look Ikura...oh wait, those are just plastic beads. Salty fishermen, the world's freshest fish, the memorable lighthouse with its faded red and white colored paint, and remarkable surfing conditions are a few of the many characteristics that describe Montauk, NY. As I roll down the window of my car, cruising down Old Montauk Highway, a salty and refreshing aroma begins to rush in through my freckled nose. The undulating is a sight like no other in the entire world. My Ikura journey has brought me to the Westlake Chowder House, which has been a seafood staple for decades. As I am seated I immediately scan my eyes down the menu to find the succulent orange spherical Ikura. I order myself a mouthwatering piece of Ikura accompanied by a spicy salmon roll and a shrimp tempura roll all plated with vast amounts of tasty sauces. I take my first bite out of the Ikura roll and immediately feel the sensational pop! pop! pop! of each individual sphere. This Ikura has a distinct salty and vinegary taste because it has been marinated in soy sauce, sake and rice wine vinegar created by Sushi Chef Steve Chen. The texture of this Ikura is rather unique, partially due to the duration of time these pieces of Ikura spend bathing in this marinade. Yet again, Ikura proves it self to be so succulent, versatile and delicious, this time in Montauk, NY. Morimoto's highly reputable name is due to its succulent food, amazing decor, and its world renowned chefs. Sushi Chef Kwang Kim was kind enough to supply me with vast amounts of information pertaining to his cooking career, personal experiences as well as his knowledge of Ikura. Chef Kim kept the conversation going by sharing stories of his childhood fishing memories with his father and his first experiences as a sushi chef in Fort Lauderdale, Florida. He also shared that before working as a sushi chef at Morimoto, he worked and trained at Nobu (another one of Masaharu Morimoto's world renowned sushi restaurants) also in New York City. With regards to the Ikura, Chef Kim stated that the Ikura he uses comes from Japan either packaged or in the actual sac(sujiko). Chef Kim also concocted an incredibly unique marinade that really emphasized the amazing flavor of the Ikura. My quest for delicious and unique Ikura has brought me to one of my favorite places on earth; Montauk, NY. This community has been around since 1852 and is known for its thriving fishing community, great surfing swells, and of course Frank Mundas the famous captain of The Orca in the movie Jaws. A tradition that my father and I have, is to go fishing at our secret fishing spot every weekend that we are in Montauk. So today, I strolled down the dock, cast my line into the shimmering harbor full of fishing vessels and watched as my lure soared through the water. As I began to reel in my line a felt something grab my lure and before I knew it, I had a fluke flopping up and down on the dock. Eventually, I had to throw it back since it was under regulation size for recreational fishing. Wait a minute, fluke don't even carry Ikura! Tonight I enjoyed a delightful spicy salmon hand roll piled high with mounds of Ikura at Kiraku, a local sushi restaurant in Long Island, New York. This Ikura was incredibly different from the Ikura from Morimoto however, both were outstanding. Tonight's Ikura was salty rather than sweet and had a completely different texture. These pieces if Ikura were a lot firmer which made for a more dramatic pop! It is also kind of ironic how the hand roll was filled with salmon and the pieces of Ikura come from within a female salmon! Today I began my journey to find the restaurants that uniquely served this succulent delicacy. My journey brought me to Morimoto in New York City which is known as one of the best sushi restaurants in this vast urban landscape. As I sat along the beautifully carved wooden sushi bar, I gazed upon a large bowl full of Ikura. These pieces of Ikura were shimmering behind a refrigerated piece glass case and were just waiting to be eaten. I ordered myself two rolls of just Ikura, nothing else inside, to experience the full taste of these salmon eggs. 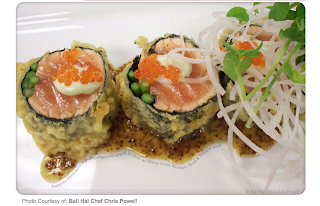 I watched carefully as sushi chef Kwang Kim intricately created each individual roll. After observing it's beauty, I lifted the roll and took my first bite. Pop! Pop! Pop! is all I felt inside my mouth as each of these pieces of Ikura released their incredible distinct flavors. These pieces of Ikura tasted like no other piece of Ikura I have ever tasted before. They were sweet, salty, and fresh which was from chef Kim's unique marinade consisting of sake, soy sauce, and yuzu pepper skin. Words cannot fully describe how amazing this Ikura tasted. The flavor stimulated my taste buds in a way that made every other piece of sushi that came afterwards taste sublime. 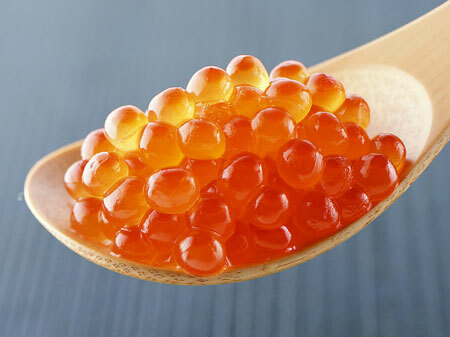 The word Ikura refers to each individual egg rather than a whole cluster of eggs. 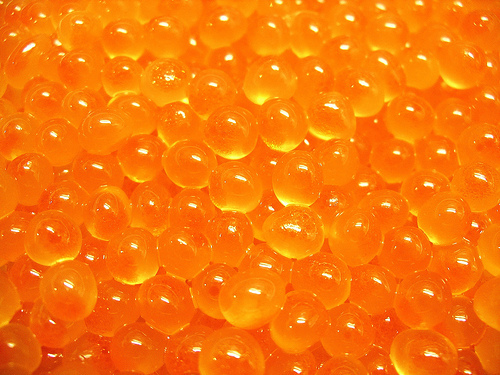 Within a female salmon, lies a pouch that contains bounties of Ikura; this cluster of Ikura is known as sujiko. Sujiko is generally sweeter in taste and also has a bright reddish color rather than an orange color. Something that is quite interesting about Ikura is the way that it is harvested. The eggs are collected from a female salmon just before the spawning period when there is a well-developed egg mass. Also, the Ikura is harvested in a way so the female salmon can still be utilized and sold in market. Just learned something new about Ikura! Recently, I have learned that Ikura is not just simply harvested from inside a salmon, placed atop a bed of rice and surrounded by a sheet of seaweed. The Ikura goes through a rather intricate and unique process to make the orangey color pop and the texture much more succulent. Each individual piece of Ikura is soaked in Japanese soy sauce and rice wine vinegar to extricate the pungent fishy odor that encompasses these mini spherical jewels. The uniqueness of Ikura is the distinct flavor that it contains within its tiny orange capsule. The flavor is composed of a fishy explosion that makes your taste buds jump, but it is a rather ephemeral taste, which in turn makes you crave more and more. Each mini "pop" of every little orb encompasses an immense amount of flavor. If paradise could exist within a piece of food, it would exist inside each individual piece of Ikura. Due to its amazing flavor, Ikura can be used in so many diverse aspects of food to make a simple plate of food turn into an incredible oasis of flavor. Ikura can be placed atop a bagel with cream cheese, within an omelette, inside of a piece of sushi, on top a simple bowl of rice, and even in pasta. The reason why Ikura is such an amazing piece of food is because of its astounding and unrepeatable piquancy that is beyond belief. 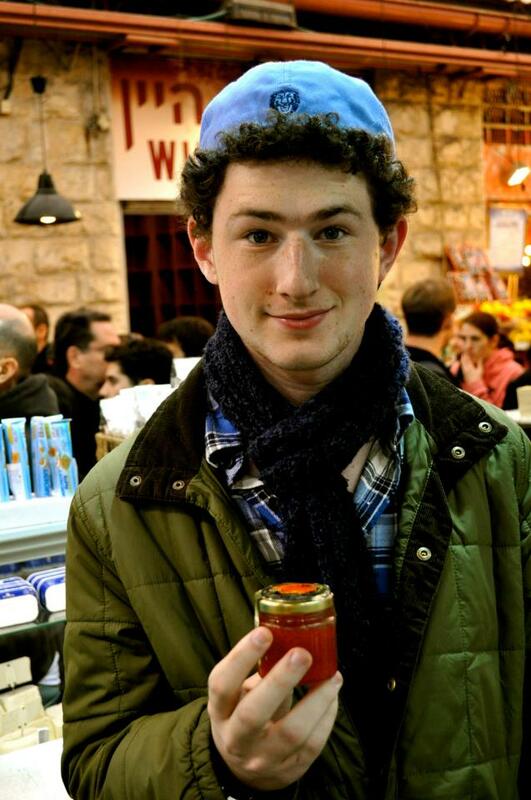 Jonathan Dweck, the one and only Ikurajon! !